I first tried these when my friend Dawn prepared them for me early this year. I was skeptical at first but if you know me, I'll try anything at least once. 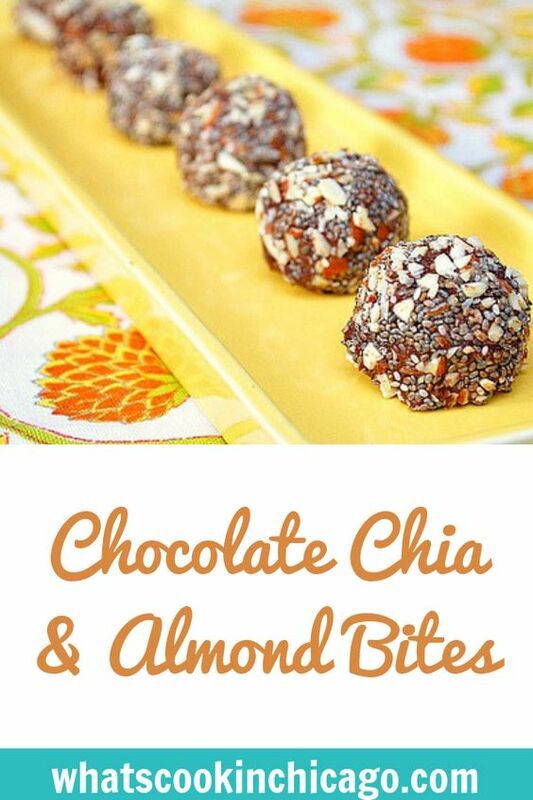 When I popped one of these bites in my mouth, I was really surprised how sweet they were and they had such a nice chocolate flavor with the crunchy textures from the nuts and chia seeds. Then while in Seattle a week or so ago, I met with the folks of Bob's Red Mill and they kindly gave me a sample of chia seeds to take home. That's when I immediately thought of Dawn and made her recipe. They were easy to make and having these bites were a lot guiltless than stuffing my face with traditional chocolate truffles. So if you're new to working with chia seeds, give these a try... it's a sweet and delicious introduction to use them! Did I mention that these Chocolate Chia & Almond Bites are raw, vegan, vegetarian and gluten free?! In food processor or blender puree dates and water until a sticky paste/ball forms. Pulse in cocoa powder, 1/2 cup almonds and 2 tablespoons chia seeds until solid dough forms. 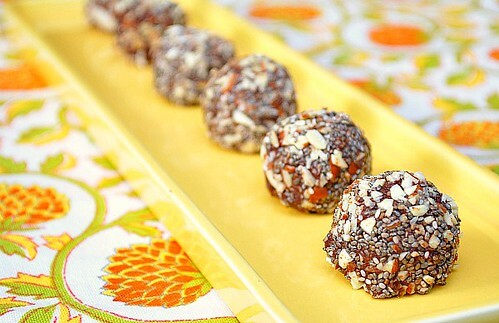 With small scoop, form mixture into 16 tablespoon-sized balls. Refrigerate for 30-60 minutes to set. Mix together the remaining 2 tablespoons of finely chopped almonds and remaining 1 tablespoon of chia seeds. Roll each ball into mixture to lightly coat. Serve or refrigerate for up to 7 days. i love the chia in this recipe! yum! Ooh, looks so east & tasty and HEALTHY! :) Thank you!